Symptom: Loud hum on speaker outputs, amplifier rebuild. As usual with an amplifier of this vintage, all of the electrolytic capacitors were replaced. This fixed the problem with the loud hum. Also one of the electrolytic capacitors was causing a bias problem with one of the preamp transistors, causing that channel to be weak. After the capacitor replacement, I was testing the amp with the oscilloscope, there was still one channel substantially weaker than the other, and both channels had non-linearity distortion. I traced this to the AVC (Automatic Volume Control) circuit. 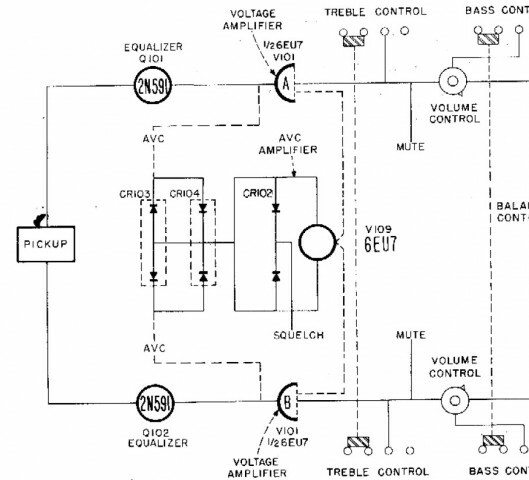 The AVC circuit is used to level the volume between different records and different sides. The AVC circuit uses the resistance through diodes to achieve this. The resistance of the diodes changes with the amount of current flowing through it. The louder the song, the more current flows through the diodes, the lower the resistance, which lowers the volume. AVC block diagram (click for larger). 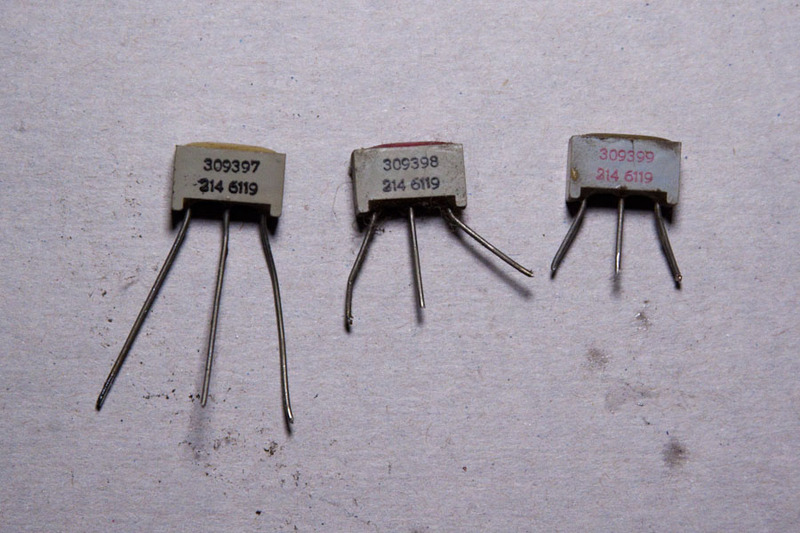 The problem with this vintage of amplifiers is they used selenium diodes. These diodes seem to fail with age. In this case, diodes in both CR103 and CR104 were bad. One was nearly open, another nearly shorted. The resistance across the other diodes was high. My multimeter couldn’t properly read them, so I relied on just measuring voltages across them. Small selenium diodes are no longer made.Silicon diodes can be used, however, you have to use more than two in series for each selenium diode you replace. I started with using two 1N914 diodes for each diode in CR103 and CR104. The resistance was too low and my signal going into V101 was too weak. So I doubled them, using four 1N914 diodes for each diode in CR103 and CR104. That was 16 diodes total. Rework showing the strings of four 1N914 diodes in the AVC circuit. One string is exposed, the others are in the green shrink tubing. 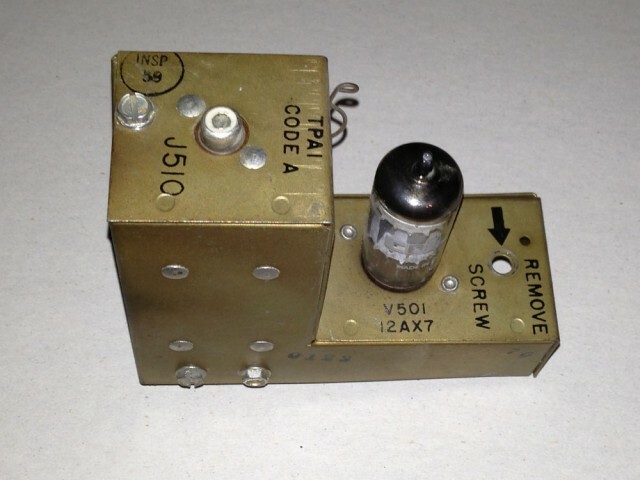 I also replaced the CR102 diode pair. For this, a single 1N914 can be used for each diode in CR102. After taking some measurements, I could have used three diodes for each, instead of four. But with four, I get a little more input into the V101 tube (about 120mV) without causing clipping on the output. The amp is now working great! So if you’re rebuilding an amp with selenium diodes in the AVC circuit, replace them with 3 or 4 1N914 diodes in series for each diode in CR103 and CR104 and use single diodes for CR102. It ends up being a lot of diodes, but they are small and cheap. Symptoms: SHFA1: one channel not working well; MRA4: generally not sounding good. Both amplifiers were brought back to my office for bench testing and repair. It’s really the only way to work on an amplifier. A known signal, usually a sine wave is injecting into the input. A dummy 8-16 ohm load is connected to the speaker outputs. With the oscilloscope, I start at the speaker outputs and observe the signal. If it looks distorted or weak, I work my way back to the inputs to find the fault. The SHFA1 had one channel that wasn’t working well. 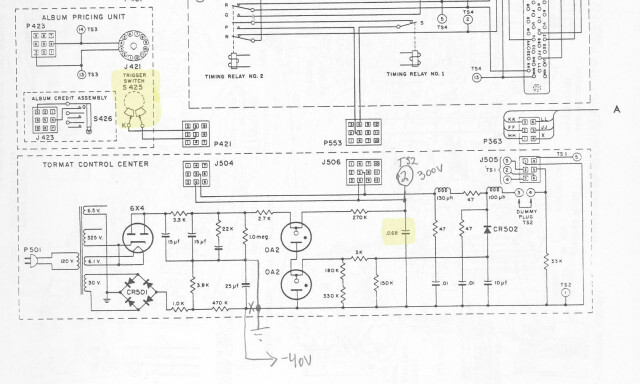 I found that the output of the first stage 12AX7 wasn’t outputting as well as the other channel at the same point. The grid of the weak channel had a more positive bias on it of a couple of volts. I traced it to a leaky 0.22uF capacitor. Once that was repaired, now the weak channel was much stronger that the other. I traced that to a bad 12AX7 just before the final output stage. 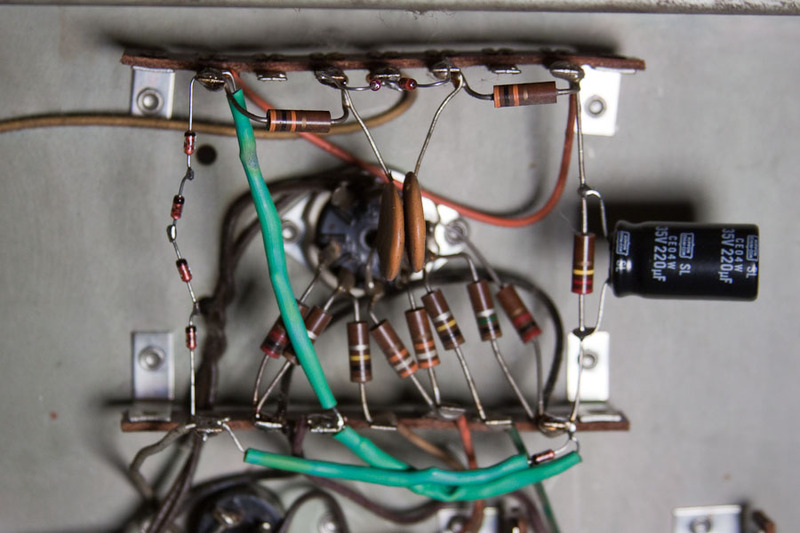 This amp had some previous work done on it, some capacitors had been replaced throughout, but interestingly, some of the most common ones that would normally be replaced hadn’t been touched, like most of the electrolytics. The MRA4 hadn’t ever been service. It still had the original paper and wax capacitors used prior to the 1960’s. When rebuilding an amplifier, I usually replace every electrolytic capacitor. If the amplifier is from 1960 or earlier, I usually replace every paper/wax coupling cap that has high voltage across it. I will usually leave tone control and other low signal voltage caps. Prior to the cap swap, the MRA4 had a weaker output than I normally see. 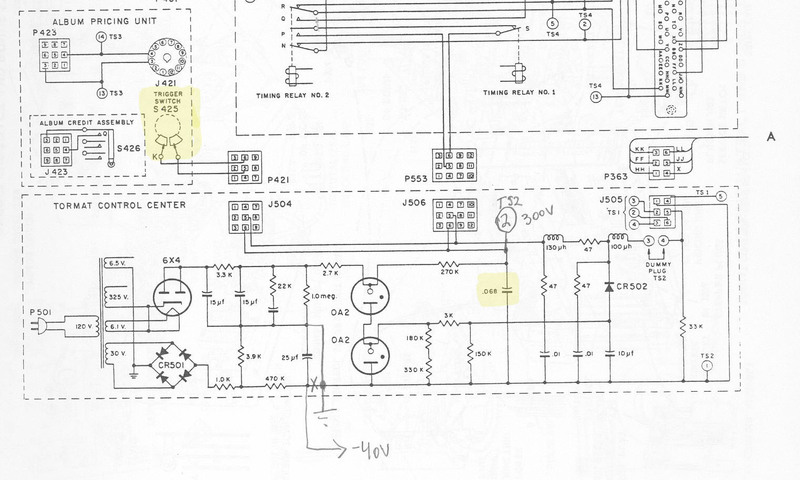 I traced this to a leaking 0.05uF capacitor in the coupling circuit to the final 6L6 tube. This caused the tube to be biased so that it wasn’t operating in a push-pull configuration. This amp still had the original 6L6 tubes installed. For fun, since I had some brand new 6L6 tubes, I installed those and they didn’t deliver the output that the original tubes did. I put the original tubes back in. I rarely replace tubes unless there is a good reason to. And this little experiment proves why. Both amps are working great! Symptom: After about 15-20 minutes, the mechanism no longer stops at selected records. I’ve come across a couple of Seeburg jukeboxes of this vintage that have had this problem. It has been a difficult problem to diagnose in the field, but I was fortunate that an owner allowed me to take the Tormat Selector Unit (TSU) back to my home office where I could bench-test it and really dig down to find out what the problem is. The first thing I had to do was replace R513 (2.2 Meg) because the -7 volt test signal wasn’t working. This test voltage is present on TP-C. Momentarily feeding this voltage into the RCA jack where the Tormat plugs in (J510) will test the pulse amplifier. The Tormat Pulse Amplifier (TPA) is the gold colored box mounted to the TSU, with a 12AX7 tube on it. Fairly quickly, I was able to determine the problem was in the pulse amplifier. 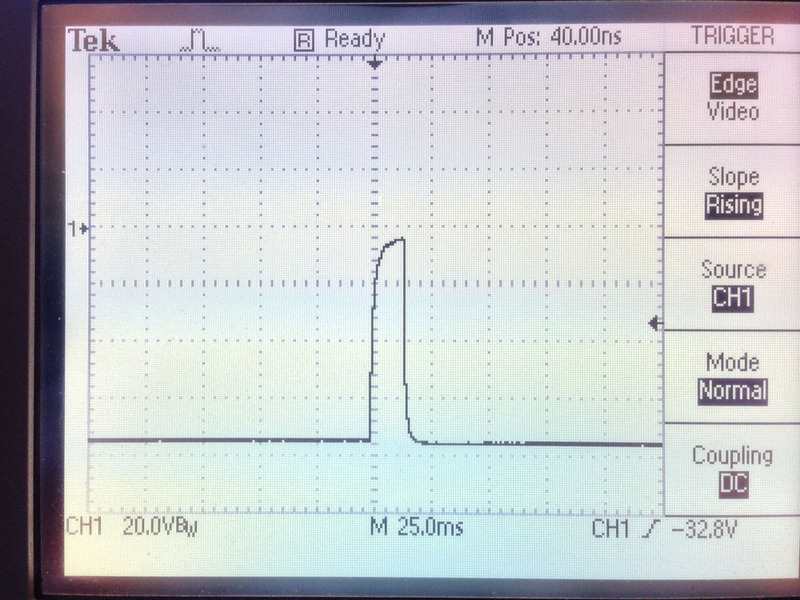 I hooked my oscilloscope to the output at Pin 4 of the TPA socket (J509), accessible from the rear of the TSU. I connected a jumper lead from TP-C to the shaft of a small Phillips screwdriver that would fit into the RCA jack. 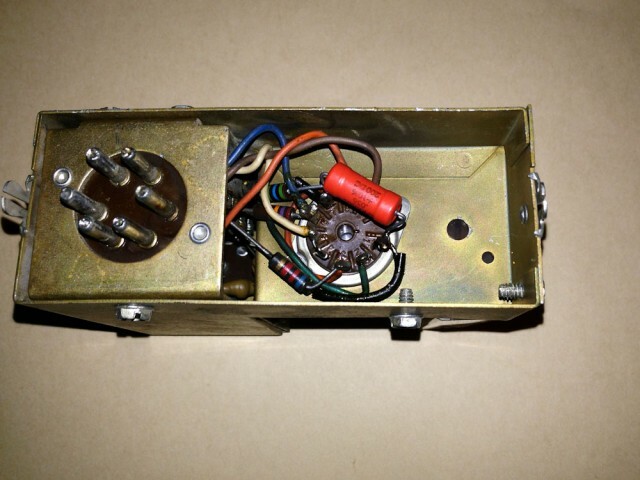 Moving the screw driver in and out would send pulses through the amp. Output of pulse amplifier when working correctly. Pulse is about 75 milliseconds. 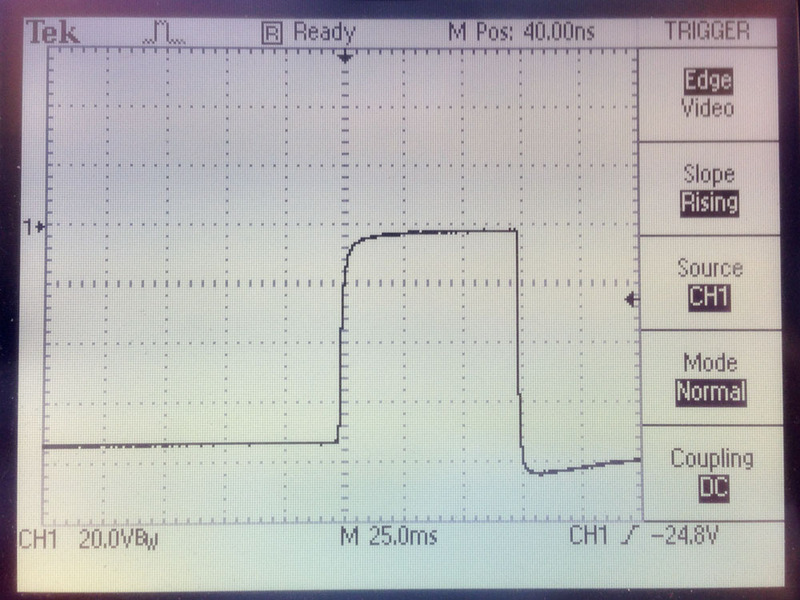 Note ground is at top of pulse and the output normally sits at about -76V. When everything was cool, the pulse output was 75 milliseconds long. As the TPA and TSU warmed up, the pulse got shorter and shorter until it was gone. Output of pulse amplifier after it warmed up. Pulse is now way too short to trip the mechanism solenoid. After trying a new 12AX7 tube, I opened the TPA box and checked the resistors. Some were marginally out of tolerance (all to the high side), but this was minor. Using hot air, I heated the amp and measured the resistors again and there wasn’t a significant change. I measured the capacitance of C506 (0.05uF, 400V), which is partially responsible for stretching the pulse to 75 milliseconds. It was 40% higher than it’s rated value. As I heated it up, it’s value more than doubled from it’s already high value. This was the culprit. The closest capacitor I had on-hand was 0.05uF at half the rated voltage. Since I wasn’t seeing more than 195V in the circuit, I tried a 200 volt cap as a temporary fix. And it worked! The pulse output remained at 75 milliseconds throughout the hour I tested it. I have ordered the 400V version of the cap as a permanent replacement. I’m glad to have finally solved this mystery. Symptom: Visible smoke coming from jukebox. The owner said the smoke was visible at the front of the jukebox. This could have been the mechanism or the selector switches, or even something from down below. I visually checked the latch solenoid, but I didn’t notice anything wrong. I checked the fuses and none were blown. I carefully powered up the jukebox. The jukebox was in the middle of playing a record when it was shut down, so it continued playing the record when I powered it up. All seemed normal. After a while, smoke did appear and it was coming from the latch solenoid behind the selector switches. This is a common problem. The solenoid isn’t designed for continuous use. Under normal circumstances, a person deposits coins, the solenoid energizes, the person makes selections until their credits are used up, then the solenoid is de-energized. That process probably takes no more than 30 seconds. In this case, the jukebox had a small pushbutton switch on the rear that gave three credits every time it was pressed. It was being used at a party and someone probably pushed the button a number of times establishing the maximum number of credits, then the person didn’t follow through and use all of the credits. Eventually the latch solenoid overheated and shorted. Victory Glass sells a solenoid protector that is plugged in between the Wired Selection Receiver and the selector keyboard. It has a small switch on it that selects between coin operation and free play. The advantage to this solenoid protector over the solutions provided from various internet sites (where the latch solenoid is wired to the hold relay), is that if a letter is selected without a number or vice versa, the solenoid eventually times out and releases after about 30 seconds. This is great if you have small kids around who might be randomly pressing buttons and then walking away. Symptom: Upon power up, carriage mechanism would travel to the right and attempt to keep going without stopping. Also, there was a wire dangling from carriage mechanism. The jukebox worked fine until it was moved to the basement. The assumption was that something happened during the move to cause the problem. Therefore it was something physical as opposed to a bad electronic component. The broken wire was from the trip switch which senses when the needle has reached the end of the record. I re-soldered the wire to the switch, but that didn’t fix the main problem. 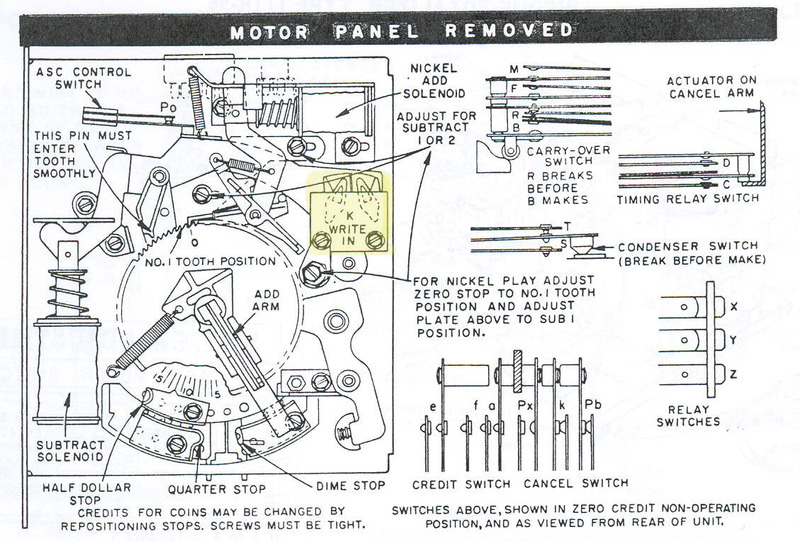 After checking correct operation of the reversing switch, I began to notice that none of the solenoids or relays were operating. That pointed to a power supply problem in the Tormat control center. I checked all connections. Nothing was obviously wrong. There is a fuse on the underside of the chassis that looked okay. I went ahead and pulled it to check with the meter, and it checked okay. As I was reinserting it, I noticed the clips on one end of the socket were spread so wide they wouldn’t make contact with the fuse. I squeezed them together and reinserted the fuse. Everything began to work properly. I adjusted the speed control and cleaned the styluses with alcohol. How the jukebox ever worked before it was moved to the basement was pure luck. Symptom: No audio. It was reported that one day it was working fine, then it didn’t. Checked the muting relay; okay. Checked the amp by playing a selection that had no record in it (to un-mute the amp) and injected an audio signal from an iPod. The amp worked fine. That left the wiring from the amp to the cartridge or the cartridge itself as the culprit. The owner had re-soldered the connections to the cartridge socket, thinking that something had gone wrong there. If I understood correctly, the socket was unsoldered when he purchased the jukebox, so he or someone else had soldered the connections originally. So there is some question as to whether the connections have been made properly. The cartridge is a stereo Pickering 340-D and I could not find any documentation as to the connections. Assuming this is a ceramic cartridge based on the age of the jukebox, I should have easily been able to see some kind of signal on the oscilloscope as I touched the needle. I checked every possible connection arrangement. As a double check, we connected the cartridge directly to the amp using alligator clips, again trying every possible combination. The only conclusion was that the cartridge was bad. In the past, I’ve seen some old crystal cartridges stop working. I’ve also seen a stereo ceramic stop working on a friend’s Grundig. Bad cartridges are nothing new, but it’s still surprising whenever I come across one. What’s interesting in both the case of the Grundig and the jukebox is that both channels stop working. I’d think that only one channel would fail, but I don’t know what is failing inside the cartridge. One of these days I’ll have to open one up and see why. Maybe they can be repaired, although I’ve never heard of it. This jukebox is not fixed yet. The owner is going to obtain another cartridge. Unfortunately cartridges for jukeboxes are becoming extremely rare. I will update this post when the owner obtains another cartridge. Something that doesn’t add up on the Jet: The cartridge is stereo, the wiring to the amp is stereo, the schematic claims the amp is stereo (but I didn’t actually verify that), and the wiring from the amp to the speakers is stereo. Inside the amp, right at the input it is factory wired to short both channels together. 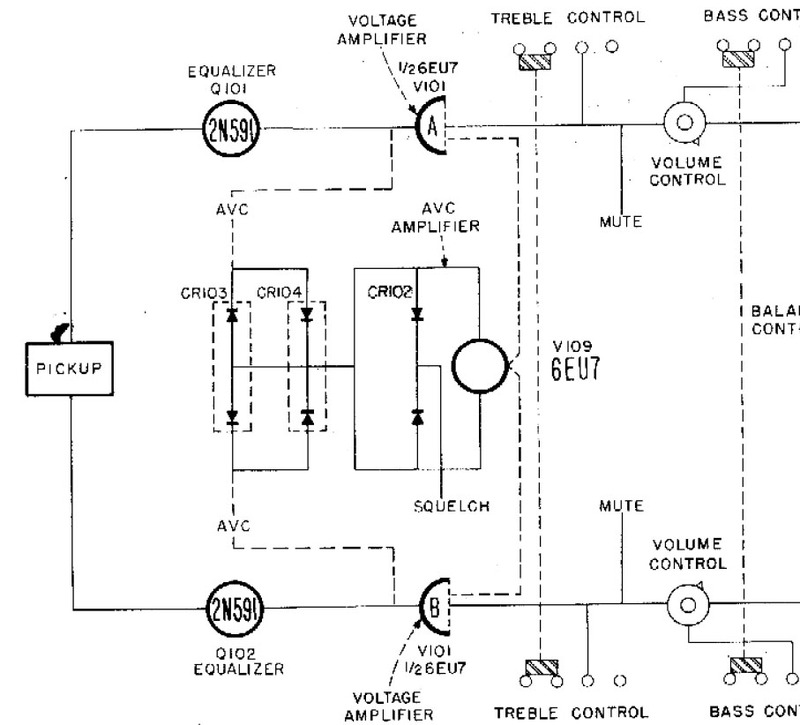 Maybe Seeburg had two versions of amps. Stereo was in its infancy in those days. Update 4/4/2012: The owner obtained a new cartridge and it’s now working!